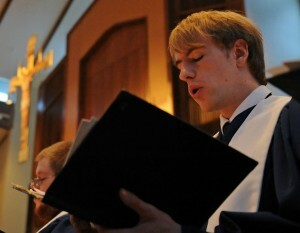 The parish music major prepares students to serve as music directors in parishes of the Wisconsin Synod. Graduates earn a Bachelor of Science degree. This major does not meet Minnesota licensure requirements and graduates are not eligible for assignment to WELS schools. Students have the option of choosing the parish music major alone (4 years) or adding a second major in either education or staff ministry (5 years). In addition to the general education courses, students must complete the required courses below. Following the program plan will also ensure that the appropriate general education electives are taken. Entry into the Parish Music major requires the successful completion of a written and performance exam. Contact the Music Division office for more information. Students may take a combination of 1, 2, or 3 credit courses tomeet the minimum requirement of 130 credits.